Packers announce Blake Martinez knee injury, return questionable. #Packers say LB Blake Martinez has knee injury and return is questionable. Watched receivers that entire sequence and no one was open. Rodgers held the ball for roughly 8 seconds, threw through tiny window for TD. The #Packers announce that Blake Martinez has a knee injury. Questionable return. #Packers ILB Blake Martinez is questionable to return because of a knee injury. Injuries have been a problem all year. Why stop now? #Packers coach Mike McCarthy, calling timeouts to stop the clock at the end of the first half. Hold your breaths. Holy cow, the whole calling-timeouts-at-the-end-of-the-first-half thing actually worked. Take a bow, Mike McCarthy. That's a huge play by Morgan Burnett. He sliced into the backfield unblocked and brought down Rainey short of the marker. Another punt. #Packers up 7-6, have 1:38 to get points before halftime, and will get the ball to start the third quarter. Huge opportunity here. The Hail Mary king .... again. Cobb, shortest guy on field, catches Hail Mary. Somewhere, Hakeem Nicks is shaking his head. 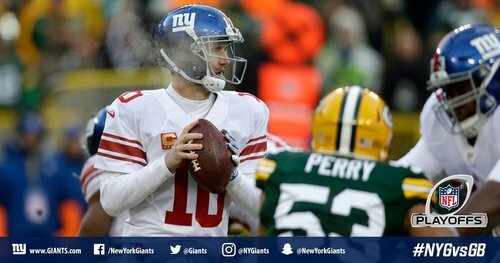 Remember, first half of 2011 divisional game ended with Eli Manning Hail Mary. Same end zone. Cobb with a 42-yard touchdown catch on a Hail Mary with no time left. Just like Hakeem Nicks in the 2011 playoff game here. Same end. Wow. Rodgers heaves one to the end zone and the shortest receiver on the field catches the ball for the touchdown. Hail Mary....again. 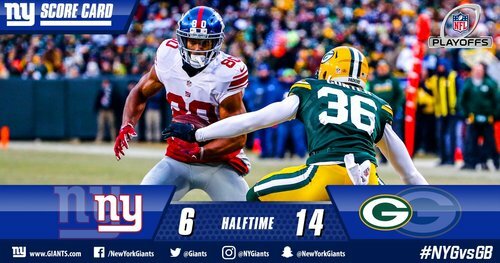 Crosby with the PAT and Packers take a 14-6 lead into halftime. 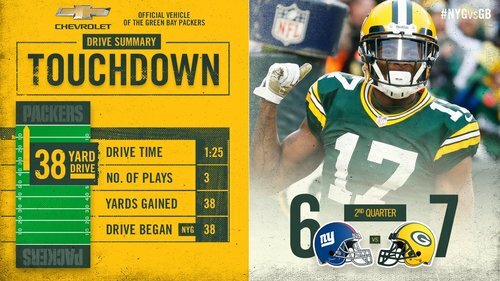 Guess it's a good thing #Packers WR Randall Cobb returned this week, huh. That was almost the exact same place where Hakeem Nicks caught the Hail Mary on Charlie Peprah and Charles Woodson at halftime in '11. #Packers lead 14-6 at halftime. Giants must be furious after how well they played for 25 of the 30 minutes. #NYG had four defenders in the area there -- Collins, Apple, Wade, Robinson -- and Cobb (with a push-off) gets it for the TD. #Packers didn't climb out of negative yardage until 11 minutes left in 2nd quarter, yet lead 14-6 at half. And they get ball to start 2nd. Rodgers is 11 of 22 for 155 yards and two touchdowns, 103.4 rating. Manning is 13 of 21 for 170 yards, 87.4 rating. The Hail Mary puts the #Packers up 14-6 at the half! Just another @AaronRodgers12 HAIL MARY!